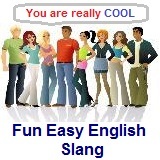 ﻿ Fun Easy English - new classroom free online classes english language lessons speaking listening writing reading november 3. Today in the classroom you are going to learn some slang beginning with the letter T.
Today learn slang beginning with the letter T.
the runs diarrhea That greasy food gave her the runs. thou thousand dollars His salary is thirty thou. threads clothes Those look like expensive threads she is wearing. tints sunglasses These are an expensive pair of tints. to the max a lot She studied to the max for this exam. totaled completely wrecked My car was totaled in the accident with the garbage truck. totally completely That car is totally awesome. turkey failure The business plan was a turkey. turkey stupid person The new employee is such a turkey. Yup the runs is not a competition. It means you got diarrhea and should run to the bathroom as quickly as possible. In this scene from the movie Charlotte gets "the runs" or diarrhea. Really funny.